Imagine that your firm is the place where prospects and clients gain access to valuable industry benchmark statistics that help them navigate the purchase or sale of a business, enhance their efficiency, gain tax planning insights, and access other business planning strategies. Now imagine that these consulting solutions are automated and fully integrated with a digital marketing tool. IndustryNewsletters and ProfitCents have partnered together to deliver accounting firms simple, cohesive, automated lead generation and client consulting tools. IndustryNewsletters is a proud partner of Apex HCM. Apex HCM designs and builds our proprietary technology in house with you and your clients’ needs in mind. Whether you are currently providing your clients with payroll and other HCM solutions, or looking to generate new revenue streams with these expanded offerings, Apex delivers turn-key, yet customizable solutions designed to make you and your clients more profitable. 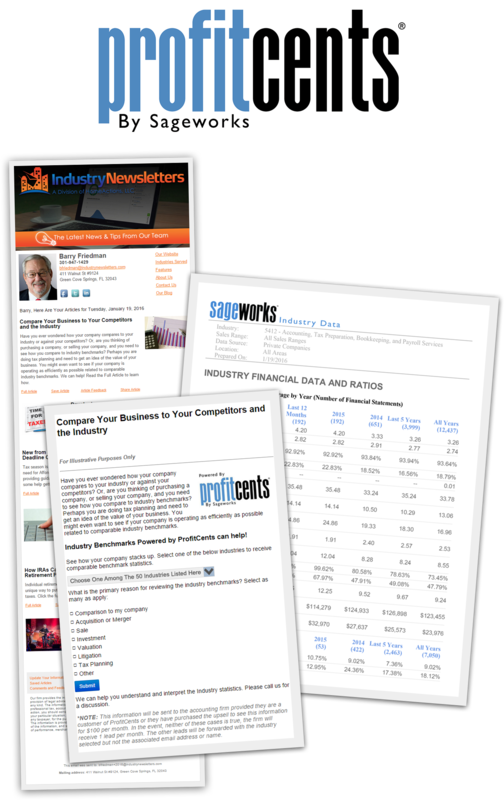 IndustryNewsletters is an Execupay Preferred Partner. Execupay has been a trusted leader in providing payroll and HR Solutions for both small and medium sized businesses since 1974, covering payroll, time and labor management, talent acquisition, talent management, and more for thousands of businesses and millions of employees. Execupay couples innovative products with white glove customer service to empower customers, allowing them to focus on growing their business. Streamline Government Contracts provides professional contract execution and management for small and medium-sized federal contractors. As your trusted partner, we help you reduce risk, increase bottom-line revenue and enhance your corporate reputation with your Federal customers. The American Academy of Estate Planning Attorneys Provides estate planners with the tools to build a successful law practice that they can be proud of. The American Institute of Certified Tax Coaches is an independent, not-for-profit corporation which trains and certifies tax professionals in the philosophy of proactive tax planning. The American Society of Tax Problem Solvers (ASTPS) is a community of over 1000 professionals from across the United States that specialize in representing taxpayers before the IRS and other taxing authorities. No matter where you’re at in this journey, the Independent Payroll Providers Association is the ASSET your business plan can’t be without.